In the last day, altcoin prices were stable. Gains or losses were within a one percent range as sellers begin to clip back gains. 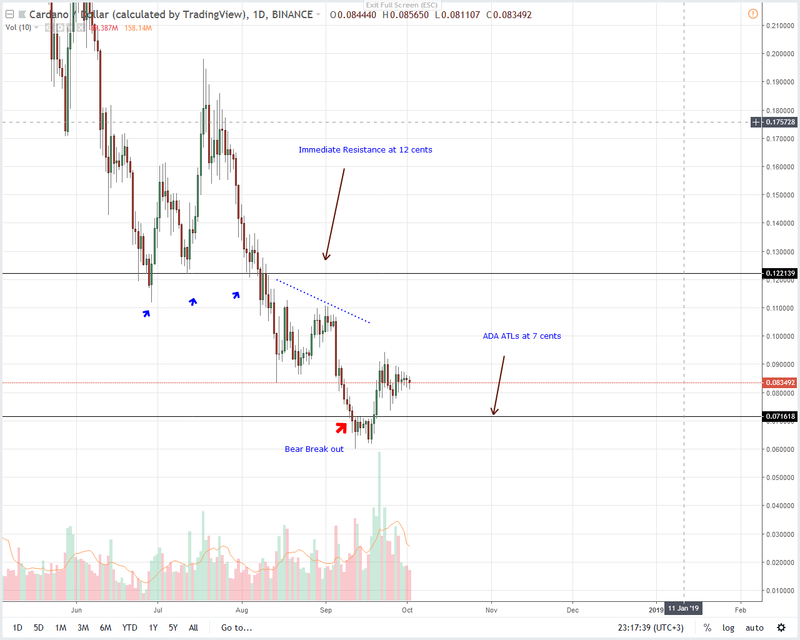 The fact that there is failure by Cardano and EOS bulls to close above key resistance lines at 12 cents and $7 backs our bearish forecast. On the other hand, Litecoin and Stellar Lumens prices continue to trend inside Sep 27 and 23 bull bars underlining our upbeat stand. At the face of block producer corruption, the weakness of DPoS and similar “energy efficient” consensus algorithms has been laid bare. And EOS is slowing down stabilizing around $5.5. 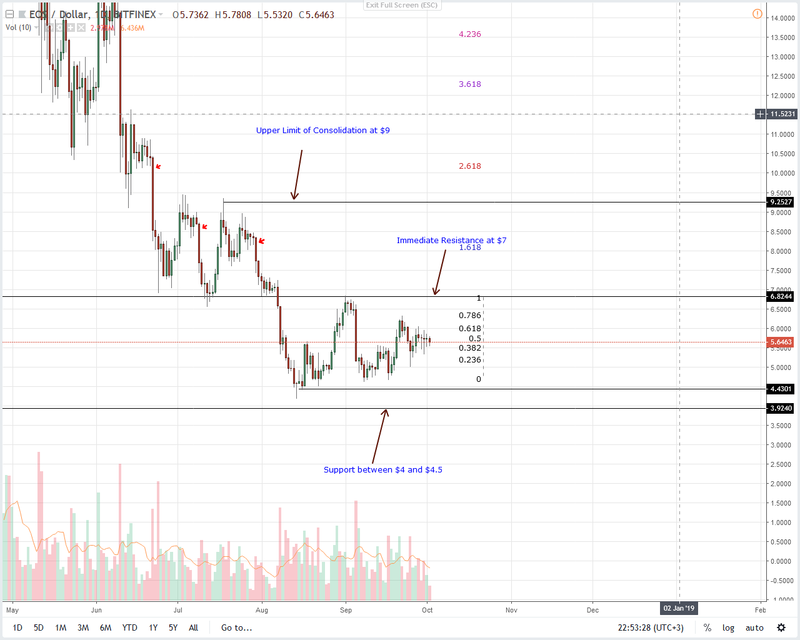 From previous EOS analysis, $5.5 is the minor support previous bull trigger line that set the tempo for gains towards $7. $7 is an important resistance level and a major buy trigger line in our EOS trade plan. 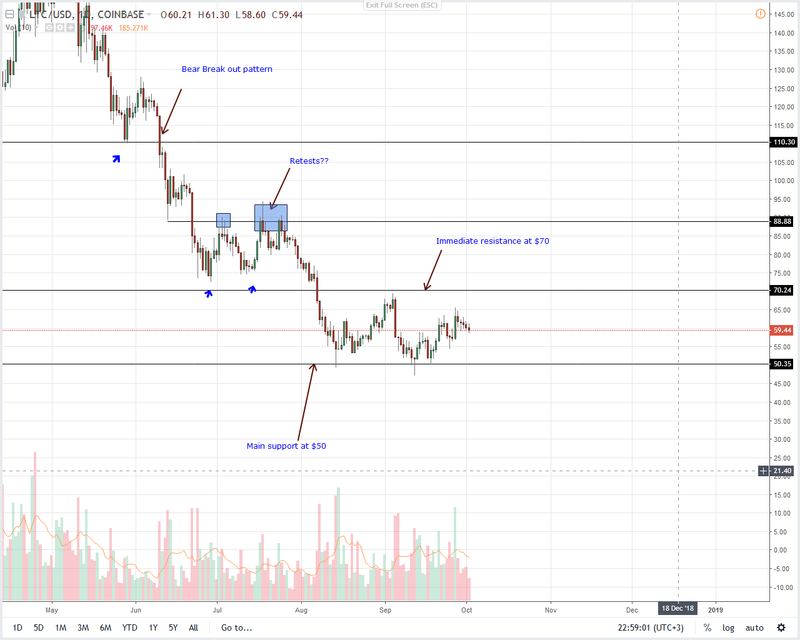 As before, EOS bears remain in control as long as prices are trading below $7. With this waning momentum made worse by yesterday’s losses, it’s likely that prices might drop below $5.5 in coming days. Note that the resistance for upsides coincides with the 78.6 percent Fibonacci retracement of Sep 2018 high low. Should today edge lower towards $5 then we might EOS collapsing below $4 deflating our bullish expectations. However, gains above $7 could lead to springs above $9. Sep 27 impressive gains underline our analysis. Technically, we remain bullish on Litecoin despite lack of market moving news in recent days. Though LTC is down one percent in the last day, the fact that sellers didn’t build enough momentum to reverse Sep 27 gains is bullish. As such, LTC bulls can buy at spot rate with tight stops at Sep 27 lows at $55. Risk-on type of traders should refrain from taking positions until after there are clean break outs above $60 in line with our previous Litecoin trade plans. The thing is: as long as Stellar Lumens prices are trading within Sep 23 high lows and above 25 cents, XLM is bullish. 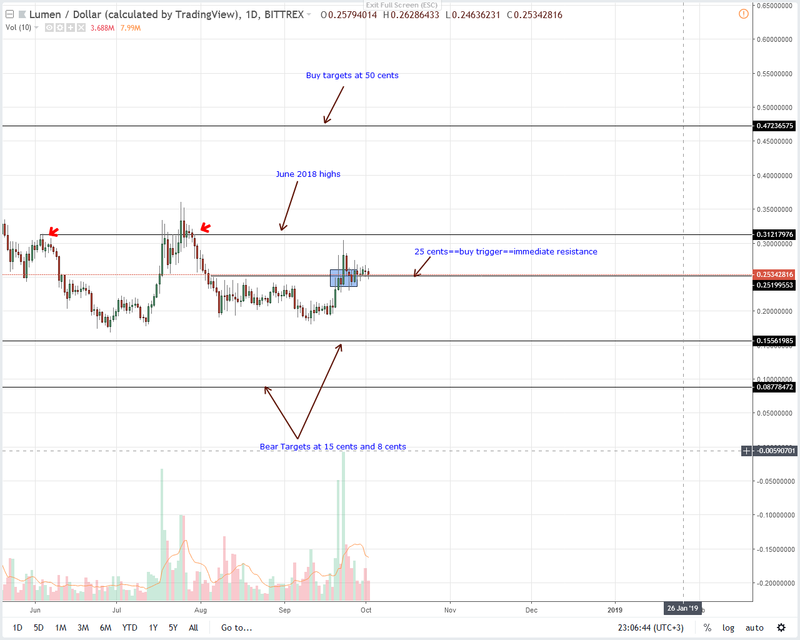 Though there is obvious resistance for upsides with XLM shedding three percent in the last day, price is finding support at 25 cents. Notice that bars retesting 25 cents main support previous resistance all have a long lower wick signaling bull entry. Coincidentally, support is clear around the 50 percent Fibonacci retracement levels. As before, bear drives below 20 cents cancels this trade plan. On the other hand, gains above 27 cents, open doors for 50 cents. No doubt, Cardano is still under development splitting views. There are optimists aiming for $1 and above while there are pessimists who think Cardano is but an Academic venture that will flop. They might be wrong—or right. Blockchain projects are notorious for flopping and underperforming despite massive airtime. While it may be a long time before launch, Cardano deserves the benefit of doubt. And trust for Charles Hoskinson. So far, ADA prices are at a precarious position. The last three weeks higher highs is encouraging but since prices are still below the all important 12 cents, bears are technically in control. Nevertheless, we note that ADA bulls are stepping up rejecting lower lows thanks to Sep 27 minor trend defining moves and failure of sellers to clear 7 cents. Going forward, any dip below 7 cents cancels this project and could lead to new lows. On the flip side, gains above 9.5 cents is bullish buy momentum could see prices retesting 12 cents cementing our last Cardano price forecasts. Like most coins under review, Monero is ranging between $100 and $120 limits. 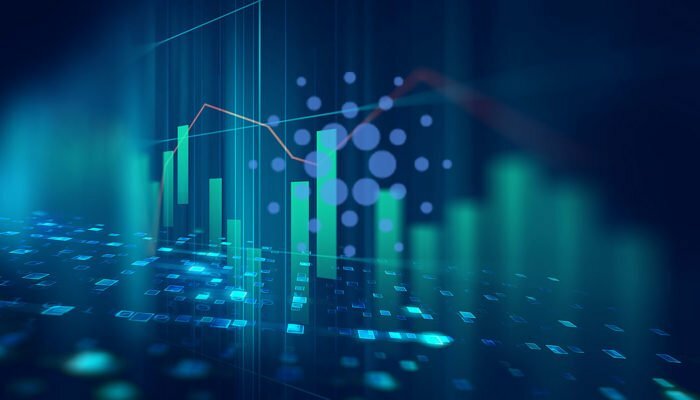 Even though there were minor dips below the main support trend line, Monero found support yesterday adding two percent. 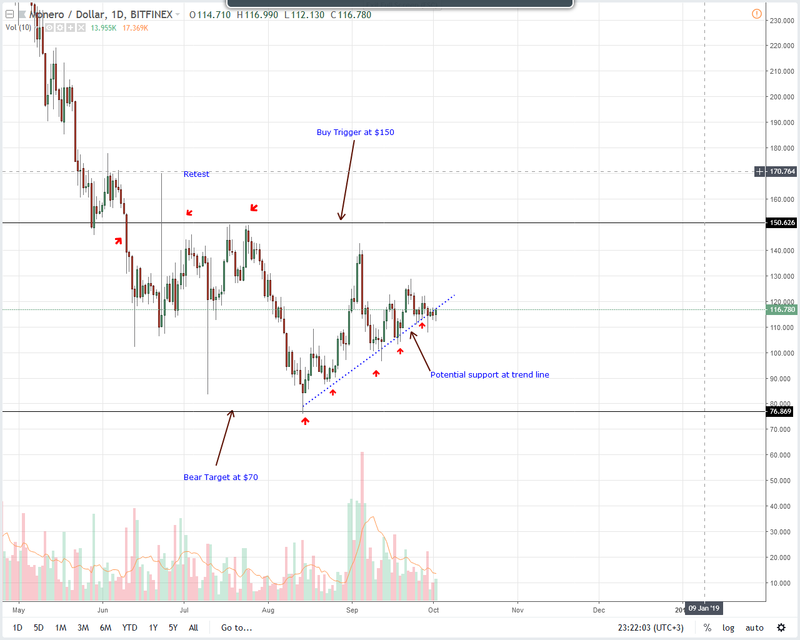 This is positive but it isn’t enough to trigger trades because as we stated in our previous Monero trade plan, Monero must slide below $100 ushering sellers or above $120 inviting buyers eyeing for $150. Since none of this has been met, our Monero trade position is neutral.